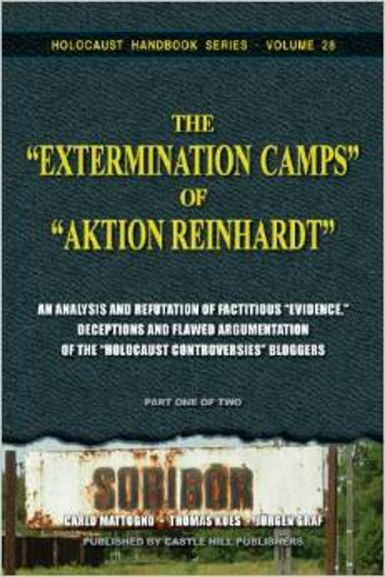 Mattogno Carlo Kues Thomas and Graf J rgen The Extermination Camps of Aktion Reinhardt - Part 2. This lengthy orthodox critique forced our three authors to go back to the sources. After a year of archival and library research, the rebuttal of their detractors' critique was finally complete, and a few months later Mattogno's major contributions to it were translated into English. After a 6-months-lasting process of thorough fact-checking and archival verification by peer reviewers, the results were released to the public. This work has occupied the most knowledgeable revisionists for a year and more. Today's leading revisionists consider this their ultimate response and final word on the subject. This study consists of two parts, each with roughly 700 pages, hence a total of almost 1,400 pages. This is Part 2. It cannot be read without the first part.